Whole Body Cryotherapy for Rheumatoid Arthritis – How Effective? 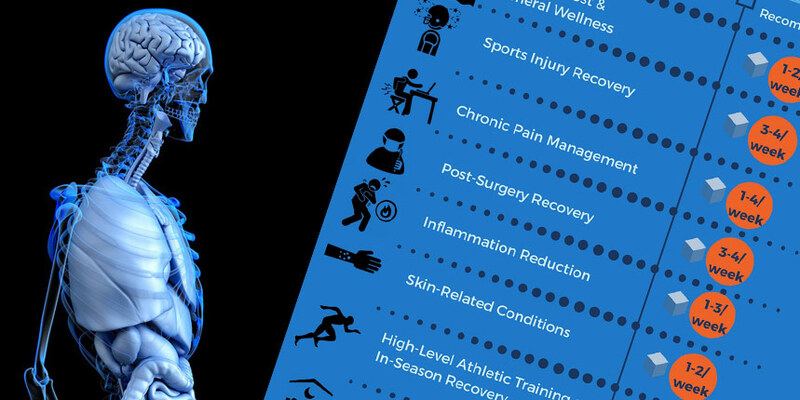 Cryogenic Chamber for Athletes Vs Cryosauna – Which To Choose? Home / Pain Relief / How Often Should You Do Cryotherapy? How Often Should You Do Cryotherapy? Many of our Cryotherapy Toronto clients wonder how often should you do Cryotherapy treatments. The answer is that it all depends on each person’s health goals, current condition, and schedule! Yet consistency is key! Just like regular weekly exercise workouts are necessary for continuous weight loss results, regular Whole Body Cryotherapy sessions are crucial to keeping inflammation reduced and immune system boosted. Without consistency, inflammation may continue to grow in the body or reappear if you don’t follow through with the suggested regimen. 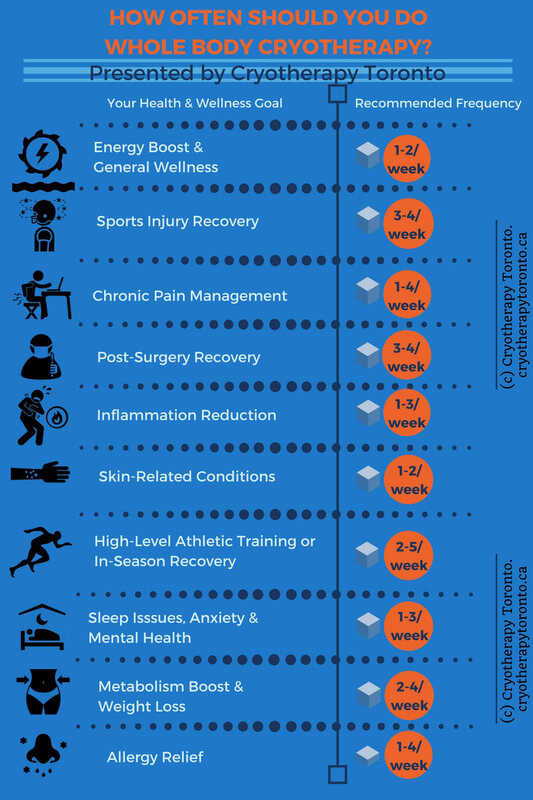 How often should you do cryotherapy if you are more ‘ambitious’ (health-wise) and are looking to speed up your results? In this case, consider “jump-starting” your recovery program with an initial two weeks of Whole Body Cryotherapy treatments 5 times a week. This can more intensely cleanse your body of inflammation before switching to the recommended number of maintenance sessions each week thereafter. To learn more about how our cryosauna works, click here. -How many days a week would you realistically be able to make it to Cryotherapy Toronto? -How frequently do you workout and/or have intense training? -Do you have chronic pain or a chronic illness (such as rheumatoid arthritis, lower back pain, seasonal allergies, eczema etc)? -Have you been in an accident or incurred a sports injury? – Have you recently had or about to have a surgery? -Do you frequently travel out of town or work long hours? Call us at 416-509-4555 or send us a message if you have any questions about how often should you do Cryotherapy sessions, and we help you find the right package that fits your schedule and meets your health needs! Or see our package prices here and call us to schedule your first session after your online purchase. Information contained on this website is for informational purposes only. Whole body cryotherapy is not recommended as a form of treatment for any illness or disease without direction from your healthcare professional. The cryosauna is not a medical device and should not be considered a medical device. This equipment has not been tested and therefore, not approved by the Health Canada, FDA or any other government agencies. The results may vary and will depend on the adherence to the treatment program recommended by Cryotherapy Toronto's specialist, as well as maintaining a healthy lifestyle outside of cryo treatments. © 2014-2018 Cryotherapy Health and Wellness Inc. o/a Cryotherapy Toronto. Canada All rights reserved.